Earlier this month, I presented a webcast on the “Underappreciated features of Microsoft SQL Server” during the “Exclusive Webcast series on Microsoft SQL Server”. As one of the developer productivity features provided with the SSMS, I presented the Template Explorer. It’s a very interesting question, and you would need the help of your IT Administrator for the same. However, here are the high-level steps to do so. 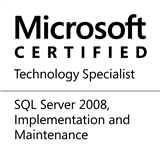 NOTE: These steps are formulated for Microsoft SQL Server 2008/2008 R2. Depending upon your version of SQL Server, the paths referenced may change. Typically, deployment of the custom template to the %APPDATA% folder hierarchy on the destination machine can be handled via a logon script by your IT administrator. Do let me know if the above mentioned steps helped you roll out custom templates confirming to your coding standards across your team. This entry was posted in #SQLServer, Blog, Imported from BeyondRelational and tagged #SQLServer on May 26, 2011 by nakulvachhrajani.